You love your fur babies (and their less-furry counterparts), but you can’t be with them every moment. Leaving them home unattended can cause anxiety and worry in some pet owners. Thankfully, the rise in smart home technology hasn’t left out our furry, webbed and gilled friends. Now we have smart tech that is designed to keep them happy and cared for, even when we aren’t right by their sides. Here’s how you can use smart tech to stay connected with your pets. Missing your favorite feline or canine during the day? Some smart speakers allow you to “drop-in” on a room in your home. You can “call” your speaker and have it automatically connect, allowing you to chat with your pets from afar. If your speaker has a built-in camera screen, you can even see what they’re up to. For those with pets who never stay still, small robot cameras with two-way communication will also serve the same purpose; although it may scare your pets. If you suspect your dog of rummaging through the trash or your cat of jumping up on the counters, you can catch them in the act with security cameras, like those you’d get with your home security system from your local internet service provider. Keep an eye on their activity to discover what mischief they make while you’re gone, and take steps to prevent possible dangers or messes. They also come in handy when you let your dog in the backyard while you’re in the house. Pull up the camera on your smartphone to see when he’s ready to come back inside. If you have less interactive pets like fish or a turtle, you can mount the camera facing a cage or tank so you can see what your pets get up to while you’re gone. Have a pet that sleeps most of the day like a hedgehog? Set a motion alert so you can peek in on the action. You miss Fido, and he misses you. Take a few minutes during your day to log into your interactive pet toy and engage your fur baby from afar. These toys take various shapes, from robots to balls, but they typically draw from the same feature sets. Smart pet toys often allow you to talk to your pet, see your pet via a camera and possibly take images and video. Some also allow you to follow your pet and dispense treats. Smart treat and food dispensers serve a few different purposes. You can use them to feed all manner of pets while you’re away, but they also allow you to interact with your pets during the day, rewarding them for coming when called or performing other tricks. A smart feeder has health benefits as well. These connected devices can track how often and how much your pet is eating to help alert you to changes in eating habits or possible overeating. Have more than one pet? Some models have pet facial-recognition so you can track more than one at a time. If you like DIY projects, there are directions out there for building your own smart food dispenser. 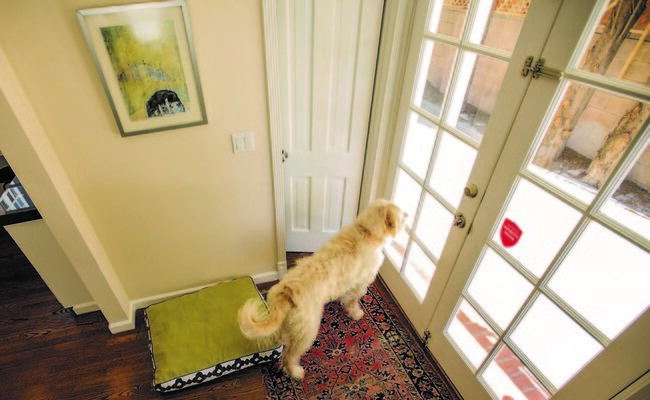 If you prefer that your pets come and go as they wish, a pet door is a great idea. Newer pet doors use special collars or microchips to unlock only when a recognized pet wants to come in, ensuring that you won’t awaken to a party of raccoons partying in your kitchen trash can. But why stop there? You can install an app-enabled pet door that allows you to lock/unlock it at will. This is useful if you find yourself having to work late and you have a dog who needs to go out, or if you’re on vacation but want to give your kitties time to prowl. The app can even notify you when your pets come and go, so you can make sure they’re safely inside at night. In more serious situations, such as a fire or weather emergency, you could unlock the pet door remotely, giving your pet a chance to get to safety if you aren’t home. While smart detectors aren’t pet-specific, they can provide a sense of security for pet owners. These smart systems work like typical smoke and CO2 detectors, but they can alert you to danger even when you are on the go. In the case of an emergency, you could unlock your pet door, and possibly even coax a nervous pet to safety using a treat dispensing ball or toy, along with the soothing sound of your voice. If your pets like to roam, a GPS collar can help you keep tabs on them to make sure they aren’t injured or straying too far from home. If they do run away, the collar will help you find them quickly. Activity tracking features will also let you know if your pet has been lethargic, an early indicator of a health problem. With so many connected options for engaging and caring for our pets, the real problem becomes how to choose. Once you have the smart devices that work best for your lifestyle, integrate them with the smart home technology you’re already using in your home. Link up your backyard cameras with your back porch smart lights, and bring the image up on your TV screen. You’ll see that Mittens has come home for the night and can let her in, without leaving your couch. Christy Matte is a mom of two children and two fur-babies: an Ocicat and a really sweet hedgehog. She’s a Boston-based writer who covers home security and automation for XFINITY Home. She’s also a die-hard techie who blogs at QuirkyFusion.com. I am very lkucky (well, I made a choice and I was able to make that choice!) to work from home so I am almost always with them. My husband takes our dog to the park and I let him out into our garden, from where he can't go away (he always stays a very short time and asks to come in). Our cats stay inside the house and in the catio we built. Thank you for this article. Pet gadgets come in handy to provide better care for your animals. I do not let my dogs or cats roam outside. I track them always! Thank you for this interesting article and tips. Thanks for the information on the new gadgets for pets. Some of them seem very useful. I like the smart treat and food dispenser idea. Thanks.